A PDF version of this transcript appears in the January 27, 2017 issue of Executive Intelligence Review and is re-published here with permission. Below is a transcript of Dennis Speed’s introduction to the Jan. 14 portion of a Jan. 14-15 Martin Luther King conference and concert. (video above). Dennis Speed: My name is Dennis Speed, and on behalf of the Schiller Institute, I want to welcome everyone today to our conference to inaugurate the New Paradigm, and to advance the dialogue of civilizations. You could also refer to today’s proceedings as the poetic principle in politics and art. It’s a two-day congress that we’re holding; we’re having a conference today, and a concert tomorrow in Brooklyn. Today, we seek and require that poetry, the poetic principle, be acknowledged at the necessary basis for statecraft and for a dialogue of civilizations. This is a transcript of Helga Zepp-LaRouche’s address to the Schiller Institute conference which took place in New York City on Jan. 14, 2017. Helga Zepp-LaRouche was introduced by Dennis Speed. Helga Zepp-LaRouche is the founder of the international Schiller Institutes. Dennis Speed: The Schiller Institute was created as an attempt to introduce that [poetic] principle into East-West relations back in 1983. But there was not really a vision in the U.S. government at that time for such a thing to occur. So Helga LaRouche, on her own, created and initiated that vision. This higher cultural idea was the actual basis, however, of what today you know as the World Land-Bridge, or the New Silk Road, or many other forms of proposals which are often referred to as economic proposals, or political proposals. But they are really policies for a new world cultural platform, and a higher conception of economics that would flow from that higher cultural conception. The General Welfare clause of the American Constitution is completely compatible with the concept of “win-win” cooperation that underlies the idea of the New Silk Road and the One Belt, One Road, which are the ideas, for example, that President Xi Jinping of China has been discussing. But, we need a cultural Silk Road as well. For the last twenty years, Helga has been known as the Silk Road Lady because of the work that she did in China and in her speaking at a conference that happened at that time in Beijing in June of 1996. Now more than ever, her contribution and the contribution that we made with respect to this idea of a dialogue of civilizations, will be the necessary basis for this new cultural paradigm. And so, it’s always my honor to introduce the founder of the Schiller Institutes, Helga LaRouche. Helga Zepp-LaRouche: Well, ladies and gentlemen, I’m very happy to greet you in this way, via video and “Hangout.” But before I speak about this subject which Dennis mentioned—the dialogue of cultures—I want to briefly situate the need for such a dialogue of cultures in the context of the current strategic situation, because we are living in such extremely dramatic times. I think, given the fact that you are in New York and in the United States, I don’t have to tell you that the situation around the incoming new President can only be described as absolutely hysterical. I have never seen such a thing in my lifetime—that you have a newly elected President, who actually will come into the White House in all likelihood in six days—but the hysteria of the mainstream neo-liberal media and a large part of the political establishment on both sides of the Atlantic have not calmed down. It seems that they still do not accept the fact that there will be a new President. 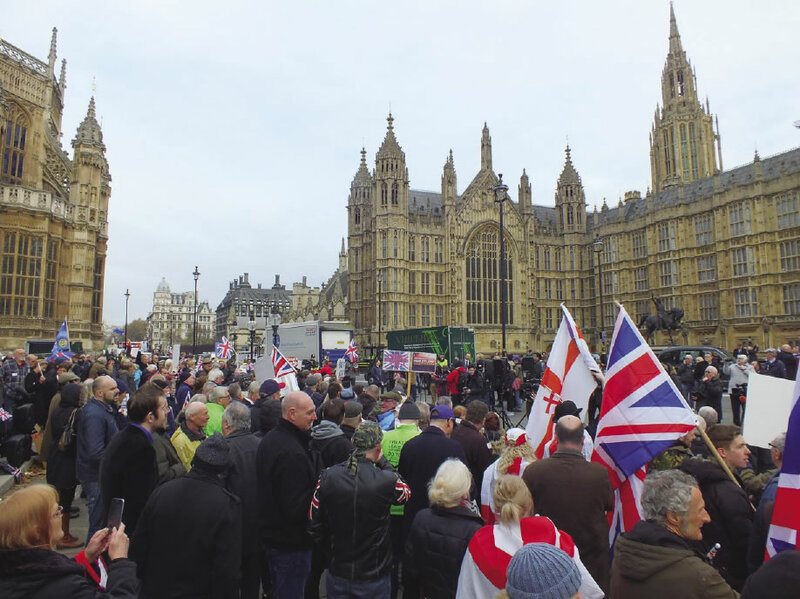 Above: Campaigners for BREXIT outside the House of Commons in London, November 2016. 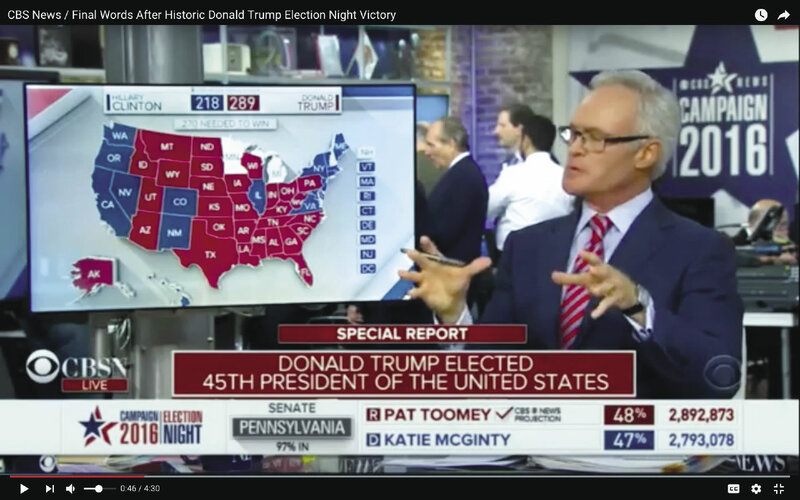 Below: The final word of CBS News on election night after the Donald Trump victory. Now this has everything to do with the fact that this is not an internal-American incident alone, but the absolutely surprising election for many—for most people—of Donald Trump, is actually part of a global process which is underway, and which is not going to stop until the reasons and causes for this process—which you can actually call a global revolution—are removed. Remember that the Soviet Union only collapsed a quarter of a century ago, which is not a very long time in terms of real history. At that time, Francis Fukuyama actually said this was the end of history, and that the Western liberal democracy model has been demonstrated to be victorious over communism. He indicated that in the future, there will no longer be a fight between ideas. Instead, the future will be characterized only by economic and technical problems, and therefore, it will be relatively boring. He was obviously absolutely wrong, because this period of history, which I would say started with the collapse of the Soviet Union, and which led to what we call “globalization,” is coming to an end. Or, has come to an end already. Obviously, that process really started with the broken promises of the United States and others not to expand NATO to the Russian border, which subsequently was broken many times. The recent deployment of U.S. and NATO troops and military equipment to the Russian borders is just the latest example of that. So, that breakdown started practically immediately, following the disintegration of the Soviet Union. But the real escalation of the financial dimension of this globalization occurred with the repeal of the Glass-Steagall Act in 1999, leading to the absolutely unrestricted speculation which then subsequently led to the crash of 2008, and which has now brought the world to the verge of another such crash, which will be much bigger and more dangerous. What has happened in the recent period, is that the people who were the victims of these changes—whereby the billionaires became richer, the poor became poorer, and the middle class increasingly vanished in many countries—there has been a revolt against that. Because the people who came to the conclusion that with this system of globalization, they would not have a future—they started to revolt; and the first massive demonstration of this revolt was the Brexit, the exit of Great Britain from the EU in June of last year. The next major manifestation of that was the vote for Trump. Especially the people in the American “rust belt,” and other areas where people felt they had no future with this system, voted against the tradition of Bush-Cheney, Obama, and therefore against Hillary as a clear continuation of that policy. Then, a couple of weeks later, the “no” to the referendum in Italy against the EU bureaucracy was an expression of the same process. It will continue, because this year—2017—there will be many elections in Europe, where you will see the same kind of dynamic in process. The trans-Atlantic establishment was completely shocked. First about the Brexit, then about the Trump victory. It was very clear that from day one, they did not accept these developments. It was quite amazing to see that they expressed shock, they expressed dismay. They used unbelievable language against the elected President of the United States. They did not accept it, but they also did not want to look at the reasons why this election result had occurred. Therefore, they decided to replace the truth with a new narrative, that Russia stole the election by hacking the DNC, by hacking Podesta. Naturally what they didn’t want people to be reminded of any more, was that if anybody stole the election, then it was the DNC stealing the election from Bernie Sanders—but that was sort of pushed under the carpet. Instead you had the non-stop accusations that Russia hacked the U.S. election process. That it was Russia favoring Trump, and therefore Russia really stole the election; which is quite an admission all by itself, and quite ludicrous. But that is what they decided to go with. Naturally, there was never any evidence presented for this. Then, parallel to the Russian hacking story as such, a British agent, formerly of MI6—British intelligence—Christopher Steele, started to put together a 35-page report with unbelievable allegations against Trump. I do not even want to give it the honor of repeating it here—it’s totally ludicrous. Again, no evidence. 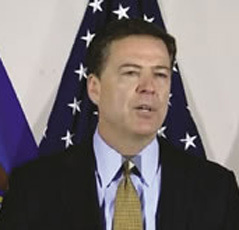 This report was already available to all the media in the election period—September, October; it was given to the FBI, but nobody touched it, because it was so clear to everybody that there was absolutely no evidence for it. So then, eventually the same paper was given by McCain to the FBI again, and only after Trump had said that he believed Julian Assange of WikiLeaks, more than the U.S. intelligence services. 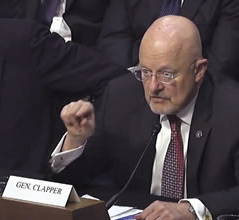 Obama’s Director of National Intelligence, James R. Clapper. 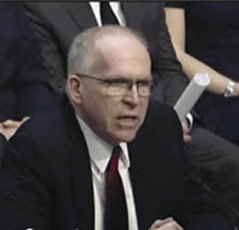 Obama’s CIA director, John Brennan. All hell broke loose, and the three intelligence chiefs—Clapper, Brennan, and Comey—first briefed the U.S. Senate, then President Obama, and finally Trump, with the so-called “evidence” of this Russian hacking. They made a 2-page summary of the 35 pages of this report by Christopher Steele, and added that into the material that they gave to Trump. With that particular act, they gave this completely ridiculous report the authority of being a product of the intelligence. Then, CNN published it, followed by the internet firm BuzzFeed, and then all rest of the media. The story broke out in the open. This occurred exactly the evening before the first press conference by Donald Trump. Obviously, this is an unbelievable story. even French intelligence people, like Eric Denécé, who is an official of French intelligence, said it is simply that the American establishment fears that a big clean-out will come with the new administration, and they will lose their privileges and economic benefits. So therefore, they oppose it; but there is absolutely no evidence for it. I think there is a deeper level to this whole thing, and that is the fact that what Donald Trump is threatening, is the unipolar world which the neo-cons and the neo-liberals have been building since the collapse of the Soviet Union. They backed regime change, color revolution, and wars based on lies against all countries that would not submit to the idea of a unipolar world run by the British and the American governments. Trump, as you know, has promised that he would remedy the relationship with Russia; and despite some tensions, there are also signs, that he may actually have very good cooperation with China, especially since he wants to attain a $1 trillion investment in rebuilding the American infrastructure. He has already received offers from China to cooperate. He had an excellent discussion with the CEO of Alibaba, the large e-commerce firm of China. He met with Jack Ma, and they agreed to together invest another $1 trillion. So the signs are actually quite good. If the United States cooperates with Russia, and has a decent relationship with China, then naturally the entire game plan to have this unipolar world—or call it globalization, which is just another word for the Anglo-American financial empire—would go out of the window. That is why they are trying to undo this election of Donald Trump. You can see very clearly that this is a direct intervention by the British. Therefore, it’s not a question of party against party. Or it’s not a question of nation against nation. It is the old dying paradigm of the British Empire—if you equate that with globalization—clearly reacting to the emergence of the New Paradigm. That New Paradigm, however, is already very strong, and is moving very rapidly. Indian Prime Minister Narendra Modi hosted the five BRICS heads of State at the BRICS Summit in Goa, India, on Oct. 16, 2016. 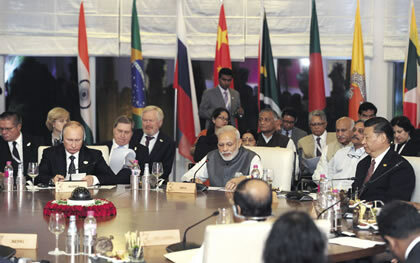 Modi is shown here, at that summit, with Russian President Vladimir Putin (left) and Chinese President Xi Jinping (right). China has initiated this New Paradigm with this New Silk Road policy, and has offered “win-win” cooperation to all countries who want to cooperate. Already, more than 70 nations are engaged with China in huge infrastructure projects, projects of scientific cooperation, the most advanced technologies, space cooperation, and other such things. It’s already twelve times the size of the Marshall Plan of the postwar period. Every day, new exciting breakthroughs are being reported. On Tuesday of this past week, the first standard-gauge railway between Djibouti and Addis Abeba started to carry passengers. This 750 km rail line was inaugurated Oct. 5 last year, and carried freight for three months for purposes of testing. China has also begun a feasibility study of the Lake Chad project, Transaqua, to replenish Lake Chad, where the volume of water has now shrunk to 10% of its previous amount. This is endangering the lives of about 40 million people living in the Chad basin. This project will reverse that decline, and fill Lake Chad with water coming from the Congo River area, by using about 3-4% of the unused water of the Congo River, which flows into the Atlantic Ocean. The project will not take water from the mouth of the Congo, but will take it from the tributaries of the Congo River. In that way, using gravity over a 500-meter drop in elevation, Lake Chad can be refilled. This will affect the lives of twelve nations. It will create a navigable waterway, it will provide hydropower, and it will open up large amounts of land for irrigation and agriculture. It is a fantastic development. Similarly, there are reports that the Kra Canal, which will shorten the trip between the Pacific and the [Indian] Oceans, and which will be one of the absolute hubs for three billion people in Southeast Asia and South Asia, is also now going to be built. These are all projects we have been fighting for, for 20, 30, or 40 years; so all of this is extremely positive and good. Together with this ridiculous Fukuyama story about the end of history, 25 years ago, you also had Samuel Huntington predicting that even after the collapse of the communist system, you would still have a clash of civilizations. He claimed that the axioms of the different religions and civilizations were so different, that there never could be unity and harmony for the human race. He wrote an absolutely absurd book called Clash of Civilizations. That is equally as wrong as Fukuyama was wrong; because with the win-win economic cooperation of the New Silk Road, you have the possibility of having a dialogue of cultures on the highest level. That is exactly what the Schiller Institute is promoting with conferences like this. The basic idea is that if all the people were just to know the most beautiful expressions of the high phases of the other culture, they would love the other culture, because they would feel so enriched, and recognize that it is a beauty that we have many cultures. It would be very boring if there were only one civilization. In particular, the Western liberal one is not exactly attractive. Therefore, if you look at the Confucian tradition in China, Mencius, the literati paintings, or if you look at the Vedic writings, or the Gupta Sanskrit drama tradition in India, the Indian renaissance of Tagore, Sri Aurobindo, or if you look at the Italian Renaissance, or the German Classical period in music, in literature—especially in music from Bach to Beethoven to Brahms—all these are contributions to universal history. Once every nation knows the best expressions of the other one, I’m absolutely certain that all conflicts will absolutely disappear, and we will have a rich, universal culture consisting of many national expressions and traditions, but still be united by universal principles of art and science. Now, the other dimension which must come to this dialogue of cultures, or dialogue of civilizations, is a look into the future. Not only back to the best traditions, but a look to where mankind should be in 100 years, in 1,000 years from now. There, it is very clear that the natural next phase of evolution is space—travel, research, cooperation, and colonization of space. If you look at the long arc of evolution, life developed from the oceans with the help of photosynthesis, to move to land. You had higher forms of species developing with higher forms of energy-flux density in their metabolisms. Eventually, man arrived. Man started to move inland from the rivers and ocean coasts, with the help of infrastructure, and opened up the landlocked areas. Now, we are at that point where the New Silk Road, as it becomes the World Land-Bridge, is completing that phase of the evolutionary development. So, the natural next phase of evolution is the development of nearby space in the first phase, and then further space travel as we develop the technologies to do so, with the help of fusion energy and similar technologies. Man will expand in space. Then we will no longer be just an Earth-bound species, but we will be a cosmo-political species, if you want. That will then lead to a completely new knowledge about the identity of the human species. We are in a period of real epochal change—a New Paradigm—where I am absolutely certain mankind is about to become adult. Wars will absolutely be a question of the past. Wars will be not worthy of the beautiful human species which has so much creativity to still discover. We are just at the embryonic stage of mankind. Anyway, I just wanted to share these ideas with you, because if Trump sticks to his guns, if he can defeat this assault against him, and if you can help to bring the United States into the New Paradigm—working with Russia, and working with China—the future will be absolutely fantastic! That is really what I wanted to tell you. Invitation: Schiller Institute in Houston, TX, 2/16/2017: A Panel Discussion: A New Paradigm--Peace through Economic Development The Role of China's Belt and Road Initiative--Will the U.S. Join?